This is Josephine. 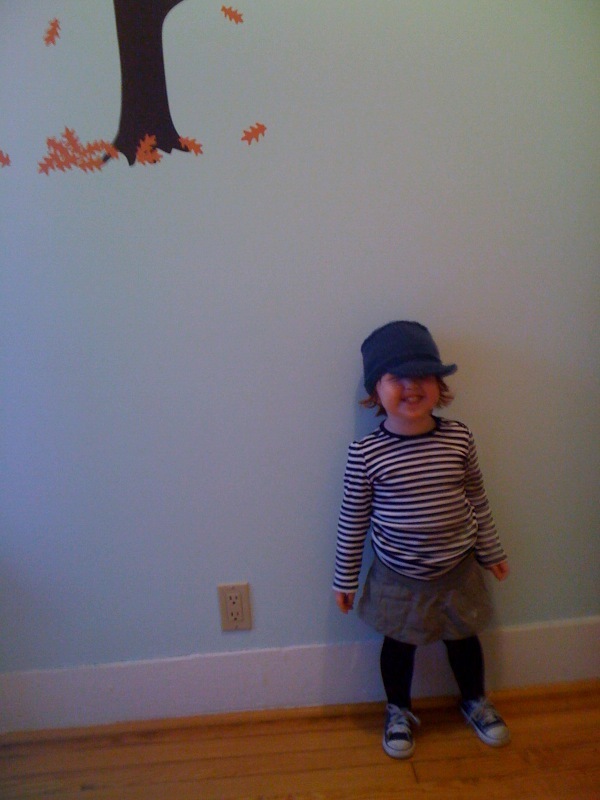 She’s almost two and a half years old and has a fantastic room full of visual interest and great artwork. Her mom, Shannon, shared these photos with me, and I was really impressed. When (re)decorating a kid’s room, it’s easy to fall into model-home/Ikea-showroom territory – especially if you’re buying everything in one fell swoop. What happens is that everything starts feeling samey, matchy-matchy, and overly coordinated. (I see this often with modern nursery designs). 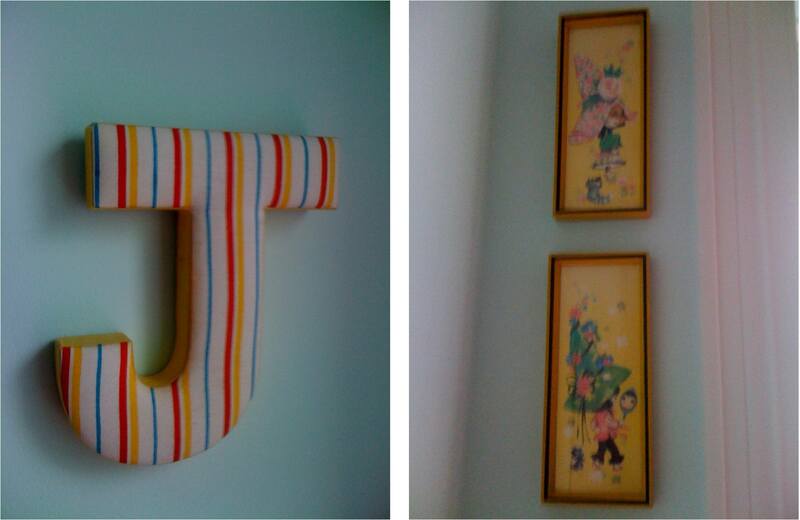 But there seems to be a shift towards using vintage, secondhand, and handmade items in kids’ rooms – a change I find really refreshing. The juxtaposition of secondhand artwork, flea market finds, and modern furniture makes for a more visually intriguing space and a looser, more laid-back feeling. As you can see in these images, nearly everything featured is either handmade, one-of-a-kind, vintage, or personalized in some way. I really love the combination of bunny picture, large initial and vintage framed illustrations – three things you might not intuitively put together but that really work as a grouping. Shannon found the three 60’s era illustrations at a local vintage shop (Union Max, if you’re in the neighborhood, specializes in this kind of stuff.) 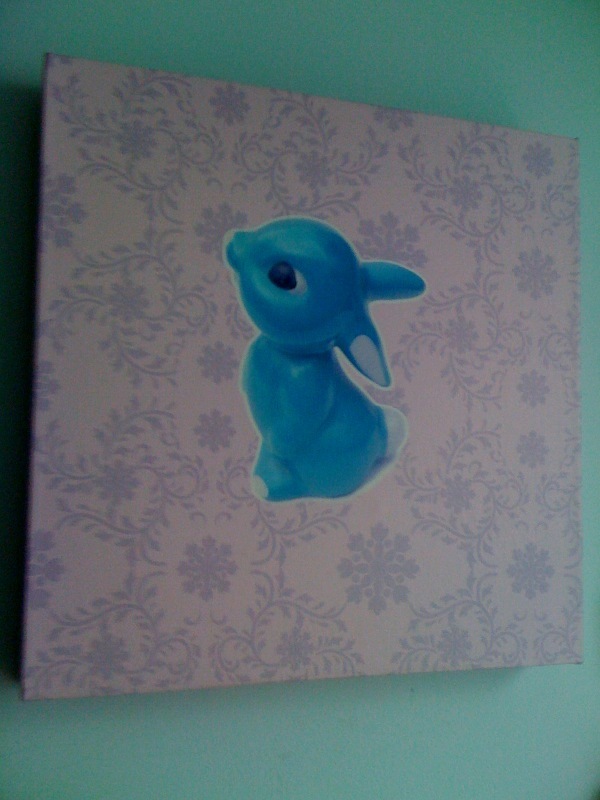 The “J” was from Anthropologie (I don’t think they sell it anymore), and the bunny was a stoop sale find. (Incidentally, I just noticed a similar image at our local frame shop. They placed a cute, but small and plain, image on top of a patterned/busy background, then mounted and framed the whole thing. I think this would be really easy to reproduce with your favorite cut-out and some wrapping paper. It’s a great way to make a small picture seem bigger and more impressive, so it occupies more space on a large empty wall). Josephine is also a very lucky girl because her mom’s friends are very talented! 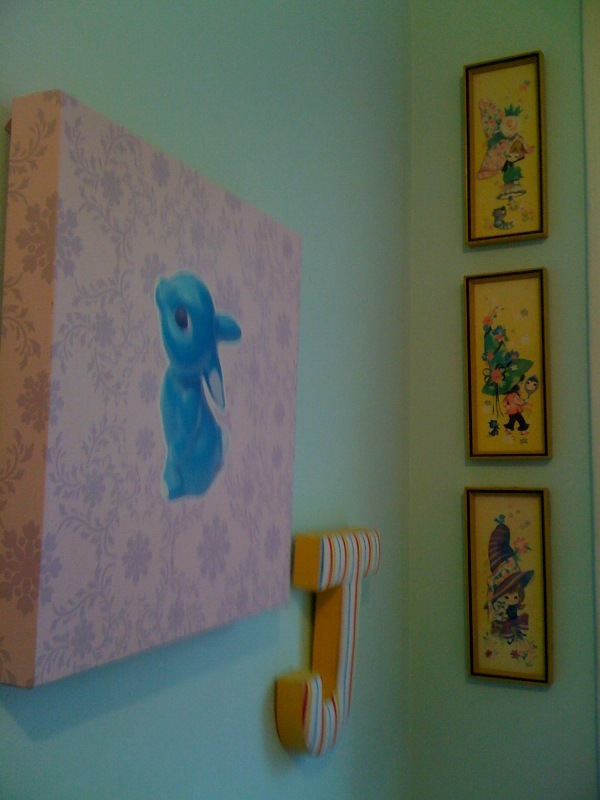 Shannon tells me that she “wanted to fill Josephine’s room with as many paintings and artwork from friends as she could.” Both the honey triptych and the moon painting come with histories that mom and daughter will be able to share for years to come. My dad reminded me today of my toddler bedroom, which was covered in animal-print wallpaper. Apparently I had a bedtime ritual of saying goodnight to each and every giraffe, elephant, monkey and lion on the nearest wall. It makes me happy to hear that Josephine does the same – with her bunny, bees and moon.